You still have some hours left and you would like to know a little bit more about Jena? Let me invite you for a stroll around and through the historical town. 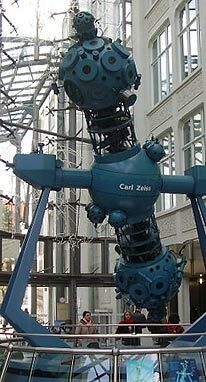 I will tell you about the fascinating development of the Carl Zeiss Company. I will also show you spots where the most important German poets Goethe and Schiller used to be and where they became friends. Friedrich von Schiller spent ten years of his short life in this town and Johann Wolfgang von Goethe, the polymath and chief minister in Weimar enjoyed being here to get an inspiration for his poetry, to work or to take part in the development of science. Let me tell you about the university, that was the most important one in Germany in around 1800 or find out where the colours of the German flag - black,red and gold -come from. Marvel at places, where Martin Luther was to calm down the citiziens of Jena, who were very enthusiastic about his ideas. But they had already tried to change things themselves. Or, in more recent times, be encouraged to feel the spirit of the Early Romanticists. Their romantic ideas spread out from Jena to all over Europe. I look forward to welcoming you on this general tour. Discover with me the city of Weimar in addition to Jena! Friedrich von Schiller moved to Weimar after living ten years in Jena to be close to the staging of his work at the theatre. Carl Zeiß grew up here before he went to Jena in order to found his workshop. Finally Walter Gropius, the architect of the Bauhaus, drew his plans in Weimar and realized them in Jena. Follow me to places where Lucas Cranach, the Renaissance painter, and Johann Sebastian Bach lived and worked as well as the big “Four” (Wieland, Goethe, Schiller, Herder) of the Weimar Classicism! I will tell you about Weimar’s “Silver Era” when Franz Liszt was court conductor and finally I will acquaint you with well-known architects like Henry van de Velde and Walter Gropius who worked in Weimar at the beginning of the 20th century. Take a breathtaking view from the Jentower, whilst listening to the news and development of the Carl Zeiss Company. Learn of the importance of Goethe and Schiller in relation to the little town next to the river Saale. Have a small glimpse into the workplace of the former tower-keeper who watched carefully in all directions and guarded the original grave slab of Martin Luther. Finally follow my guidance to the outskirts of Jena in just 30 minutes. Sabine Weiß and if you like the restaurant Scala look forward to welcoming you on the 128 m high viewing area. 30 minutes, in English 75,00 € per tour and 3,50 € p. P. fee for the viewing area (reduced price 2,50 € if more than 15 persons). I recommend groups up to 25 people.